(see list below). Perfectly suited for an extended family gathering or for two or three families, complete with wireless internet. We have a private 7 person hot tub on the deck overlooking Alder Creek and the surrounding woodland. The same private deck also contains an outdoor barbecue. There is a 46' High Definition Plasma TV with Cable and Blu-Ray in the loft lounge area and a beautiful stone fireplace in the living room. The master bedroom suite is on the main floor just a few steps away from a spacious bedroom with a California king bed, a twin bed, crib and changing table for small children or babies. Street-level garage with room for 2 cars (level driveway with parking for 4 more cars). Fully furnished kitchen equipped with upscale appliances, five burner stove, two ovens, microwave, toaster, as well as traditional coffee pot and Keurig coffee makers. The cabinets and refrigerator are stocked with most condiments. Bar seating seats 6 + dining table seats ten more. House has all new furnishings - Calvin Klein down comforter/duvets, high thread count linens, great new beds. Mountain style decor, including granite, tile & travertine accents throughout the house. Access to all of the community amenities such as swimming pools, hot tubs, a large gym, golf driving range, a sledding park, playground, tennis courts, equestrian center (with great pony rides for kids) and much more. Donner Lake is less than 10 minutes away with a fabulous private beach and Club House with snack bar, beach chairs, barbecue pits, as well as boating and water sports equipment rentals. You are also just minutes away from the Tahoe Donner Golf Course and the Coyote Moon Golf Course. 20 minutes from Squaw Valley, Alpine Meadows, Northstar at Tahoe, and Sugar Bowl Ski resorts. Children’s/Twin room – Twin bed and two available pack n’ play cribs and changing table with adjoining full bath. King Room – Cal King Bed with slider access to backyard. Queen Room - Queen bed with wonderful views. Bunkroom – 2 sets of Bunk Beds and one pullout Queen sofa - room has door to lower deck and backyard. There is a full bath downstairs. Kids play area has 32” High Def Plasma TV with Cable & DVD player. We are an active family with 2 young boys, and enjoy quality time together with our extended family. We spend as much time as we can enjoying our mountain home while taking advantage of all of the local hiking, biking and skiing! Tahoe Donner is fabulous for families! Our backyard is phenomenal, with great sledding in the winter and the gorgeous Alder Creek is at the foot of our backyard. It's a great place for the kids to play, build forts, fish and explore. There are incredible hiking trails that leave right from our yard! All new high thread count linens. All new down comforters and pillows. Calvin Klein duvet covers. 2 car attached garage (with 2 remotes) and parking for 4 more cars on level driveway. With Ice & Water in Door. 2 ovens are in the kitchen. Keurig, coffee machine, espresso maker and french press are available. Spices and seasonings for all are in the kitchen cabinet. New sets of dishes for both adults and children are stocked, along with plenty of mugs & glasses. Huge, open and well stocked kitchen with 2 ovens, 2 sinks (bar sink), dishwasher, microwave, instahot and lots of cabinets for storage. 1 kids bicycle is in the garage, along with a jogging stroller. Fabulous view of the mountains from the deck & hot tub! XC skis, boots and poles are in the garage. Trout Creek Recreation Center has 2 swimming pools (huge kids pool & lap pool) and Northwood Clubhouse has a pool with a waterslide. Private outdoor hot tub for 7 with built in speakers/stereo system, complete with iPod/mp3 connection. Beautiful, comfortable home! Great amenities. The house is wonderful. Plenty of space for multiple families. The kids had a wonderful time sledding in the back yard. Even though the home is large, it has a warm cozy feel. We loved it. Thank you for choosing our home for your family vacation. We are glad you loved it & made some snow memories with your family! Outstanding property for our multiple family getaway. Lots of bedroom and sleeping options to accommodate our 11 without feeling crowded or unable to get personal space. Comfy common living spaces and amazing kitchen. Nice short hike along the creek that links up with other Tahoe-Donner neighborhood trails and dozens of other hikes in easy driving distance. 20 minutes to Lake Tahoe and river made for easy day trips to kayak and river float. Many food options nearby. Summer months mean hotter weather -- 3 levels in house provided easy transition zones depending on time of day. TV Loft area was the only spot in house that got too warm with afternoon sun; sleeping levels and main living space were fine even with outdoor temps in high 80s. No problems or concerns at all. An easy recommend for extended family get together. 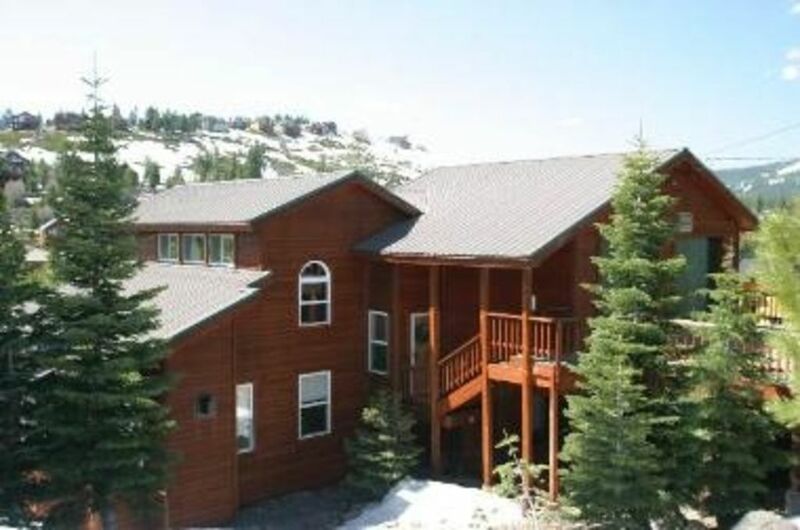 We are so glad you & your family enjoyed your time in Tahoe and that our house was a good fit for all of you! We hope you visit again. We stayed here for the 2nd time (last time was 2 years ago) and it was just as great this time - except the lack of snow! Even so, we were able to make a little sled run out back with the small amount of snow there was, we hiked down by the creek, and spent a lot of time relaxing. For those unfamiliar with Tahoe, I recommend Boreal for skiing when snow conditions are good, and Mt Rose always has good conditions since it is so high. We also shopped in Truckee and went tubing at Squaw and skating at Northstar. The week was full of action for those that wanted it, and the house was excellent and well equipped for the old folks and injured folks (me!) who stayed at home. A great time with family, Chalene was great with communication. Thanks again!! Thank you for your kind review. We are so glad you were able to come visit again & found some Truckee charm in spite of no snow. We appreciate great renters like you! I wish I could give this property (and the amazing owners) 6 stars! Most importantly, Charlene and Vaughn were incredible hosts. They were VERY responsive, and replied to our queries very quickly. Charlene & Vaughn - Thank you for letting us make some wonderful memories in your beautiful home! We hope to come back! We are so glad you loved your vacation and our home! Thank you for choosing our home and for your glowing review. It was a pleasure sharing our home with you & we hope you can visit again! Beautiful home, great location and perfect for families with kids! We truly enjoyed our time at hillside haven. The home is beautiful, well kept and very clean. The kitchen was stocked with everything you would need and then some. The rooms and beds were very comfortable and the bunk beds perfect for our kids. The trails behind the home were great even for kids and the Tahoe dinner amenities were very nice. Our hosts Charlene and Vaughn were very responsive and gracious. We travel here often for a quick family getaway and we would definitely stay here again. Thank you for your gracious review. We love seeing families build memories at our Hillside home, and we are very glad our home fulfilled your expectations! Guest access to the great amenities of Tahoe Donner - ski hill, XC ski center, 3 pools, tennis, horseback riding, golf and private beach club on Donner Lake.